Headaches can affect a child’s ability to concentrate, focus, and perform well in the classroom and on the field. Headaches are usually split into two categories, primary and secondary. Primary headaches are the result of problems with pain sensitive structures in your head. These include migraines, tension headaches, chronic daily headaches, cough headaches and exercise headaches. Secondary headaches usually point to an underlying condition activating the pain sensitive nerves in the head. These include sinus pressure, concussion, dehydration, ear infection, flu, tooth pain, etc. More serious causes of headaches can occur, for which you would need to see a doctor immediately. Physical therapy is well suited to help patients with headaches. Most primary headaches can be related to or made worse by muscular tightness in the neck, base of skull, and head. This tightness can be due to trauma, joint stiffness, joint instability, poor posture or overuse. Physical therapists can address this muscular tightness in several ways. We work on increasing the flexibility of the muscles involved, improve the strength of the musculature in the area, and mobilize stiff joint segments. We also address the child’s posture and stability of the area by retraining the musculature to work in symphony with each other to achieve good posture and stability of the neck and shoulders during static and dynamic activities. Be aware of your posture. How are you sitting when at school? Where do you do your homework or read? Is it on your bed, or couch, or on a desk? Try to improve your posture by sitting up straight, preferably in a chair that offers low back support and keeps you upright. Make sure that the computer or books are close enough that you can read easily without looking down or sticking your chin forward. Take mini breaks throughout the day. A good rule of thumb is a 2 two- minute break for every 30 minutes. During this time, get up walk around your space, stretch. Stretch. Your muscles tend to tighten down to match the movement they are allowed during the day. If they don’t move much, they will begin to tighten. Neck and shoulder stretches are important to loosen the muscles you use to hold your head up and use your arms during the day. The stretches should be held for at least 30 seconds for better results. Build strength in the muscles of the neck and shoulders. The stronger your muscles are, the better they can handle the stresses of the day. Exercises could include chin tucks, shoulder shrugs, lat pulls, rowing, pushups and tricep dips. If you have any questions, please feel free to contact your pediatrician. 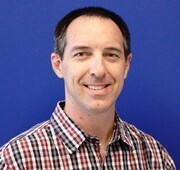 Bruce Morgan, PT, is a SPORTS physical therapist at Cook Children's. Our physicians, therapists, nurses and technologists work exclusively with kids and understand the unique needs of a growing athlete's bones, muscles, body and mind.